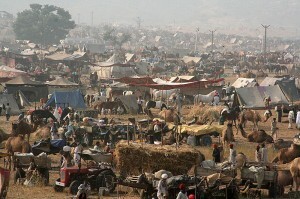 Puskar Mela is the world’s largest camel fair, which hosts around 50000 camels in this huge event. The camels are decorated, sold, raced and also shaved. 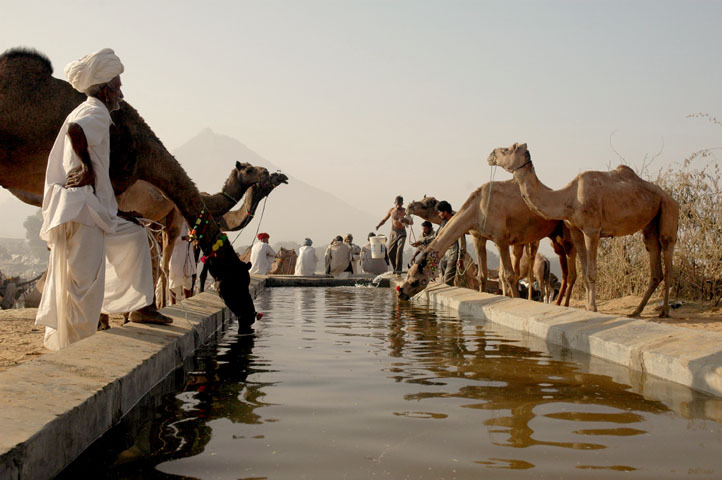 A whole celebration of camels, a place where they enjoy their true importance- Pushkar Fair. Pushkar is a place in the Indian state of Rajasthan; the event is a big and famous thing among people everywhere in the whole world. It pulls so many people from the world that the population of the place increases to 2 lacks from a mere fourteen thousand when the fair is on. Though small but beautiful town of Pushkar is set in a valley just about 11 km off Ajmer. It is Surrounded by hills on the three sides and sand dunes on the fourth, this place takes a very fascinating location and a just the perfect backdrop for the annual religious and cattle fair. The fairs which are famous worldwide and pull thousands of visitors from all around the globe. A tour to Rajasthan is not complete without this. This happens once a year and it is a five-day fair. Considered very sacred and holy by the villagers around, the fair is a relaxing time for the villagers in and around the city. A very colorful fair, with men and women dressed in so many colors. Such a colorful sight is a relaxing and soothing sight for the eyes that see all arid deserts all around. The large well touched turbans of the males visiting the place, who set their animals for trade or to set up other trade forms, such as shops selling goods, the women dressed up in well decked up ghagharas ( skirts which just touch the ankle), arms full of bangles, well jeweled from head to toe in different kinds of jewellery. The typed jewellery of Rajasthan which adds a lot of charm to their dressing and intrigues the visitor. It is an occasion which gives the Hindu pilgrims a chance to wash away their sins and wrong doings by going for a holy dip in the sacred Pushkar Lake. 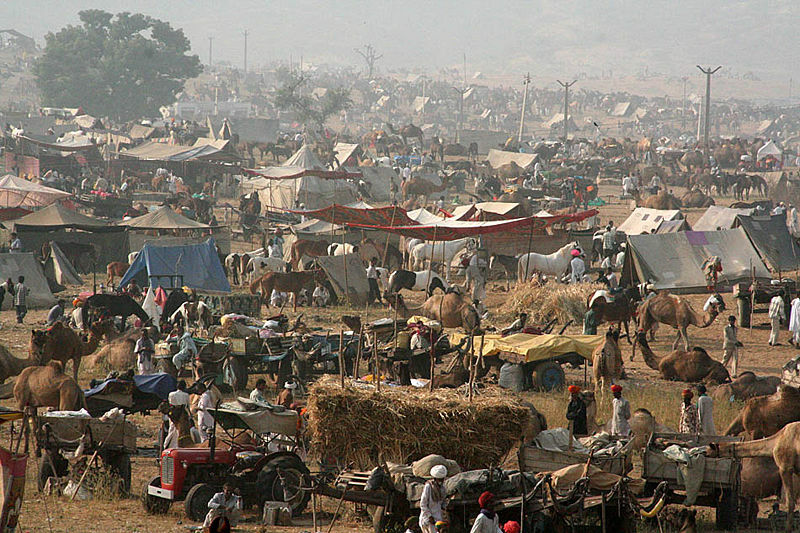 Pushkar happens to be one of the five dhams held with high esteem of pilgrimage spots. As per a legend, the Pushkar Lake happens to be surrounded by at least 52 palaces and 500 temples. This was for several kings and other royal in those times, who would maintain this place for pilgrimage. Pushkar also has the only Brahma Temple of the country; this is a very important place for the Hindus and hence holds a high level of importance among the devotees. Pushkar, provides a lot of avenues to recreate and shop, the market is huge in the times of fair, we can see people from nearby areas trading their goods, which are mostly the specialty of the particular place, such as the bead necklaces of Nagaur, woolen blankets of Marta, textiles printed in Ajmer and Jodhpur and so much more. During the fair, cultural shows and exhibitions are organized to enliven the event. The place can be easily visited with the help of tour operators, a must visit if on tour to Rajasthan, it is indeed an experience not easy to forget. If you have not decided yet or wants to customize tour itinerary or hotels listed above in "Pushkar Fair- A Complete Reflection of Rajasthan", then we can change the travel itinerary and make a personalized, tailor-made holiday package, especially for you. We can modify this travel package as per your itinerary, budget, duration and the tourist places you would like to visit, including transportation and airfare should be included or not. Please fill the form below to contact us.